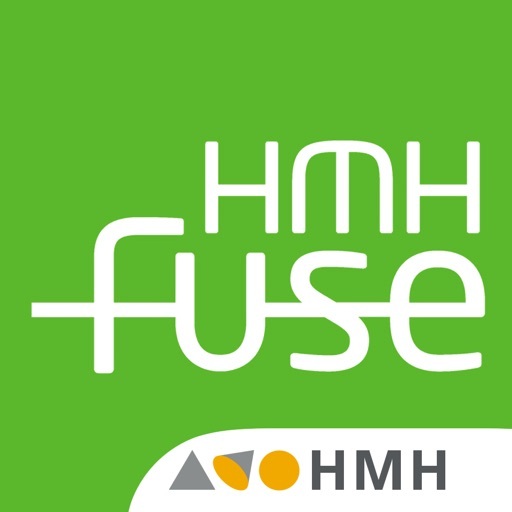 HMH Fuse Geometry Common Core Edition gives every student a personalized learning experience using video tutorials, MathMotion step-by-step examples, homework help, quizzes, tips, hints, and many other integrated features to teach, review, and assess all concepts. 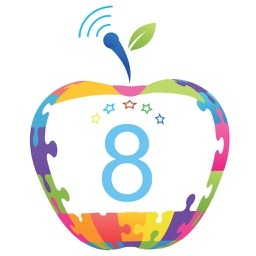 Other features include the ability for students to show their scratch pad work for individual questions on the assessments, student response system (clickers), and Graph It! examples permits students to explore the example conceptually. 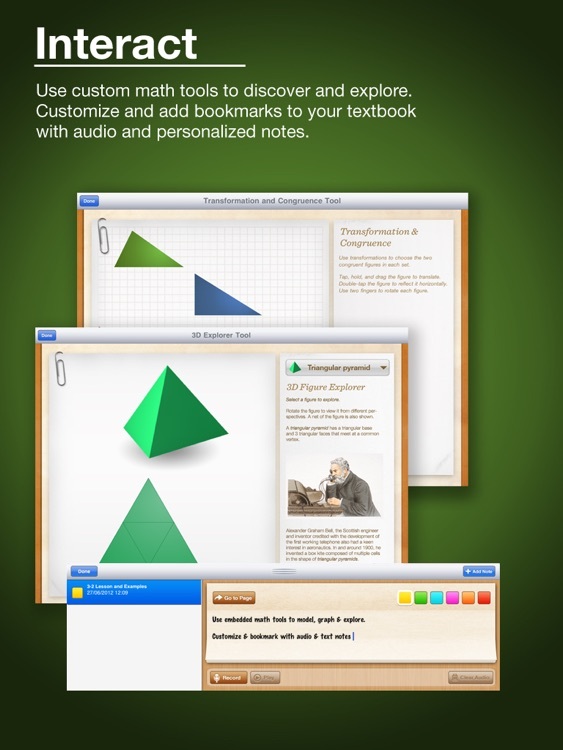 Students will benefit from an all-in-one app with built-in tools including Algebra Tiles, Linear Explorer, Quadratic Explorer, a graphing calculator, text and audio note-taking, scratchpad, and a student response system for instant learner feedback. 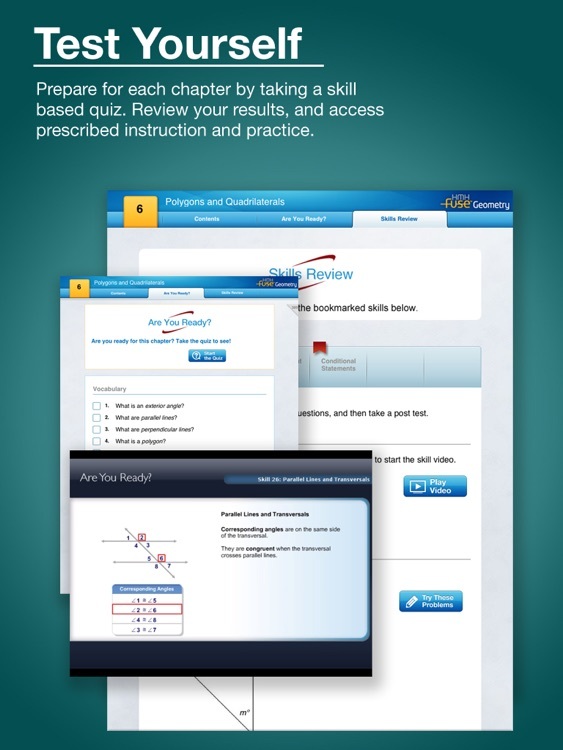 For institutional users, teachers can access all assessment results in an on-line Teacher Resource Center and prescribe remediation or intervention as needed. 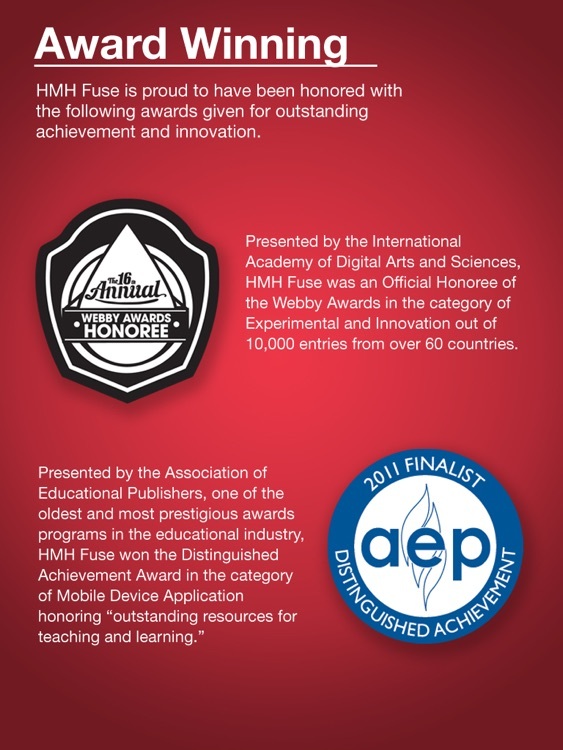 Following a year-long FUSE pilot at Amelia Earhart School in Riverside California, the results are in. 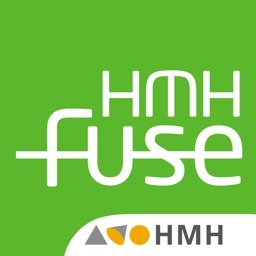 Comparing student performance, over 78% of students using HMH Fuse scored Proficient or Advanced on the state test, compared to only 59% of their fellow students at Earhart – a difference of 19% in favor of students using the HMH Fuse app. 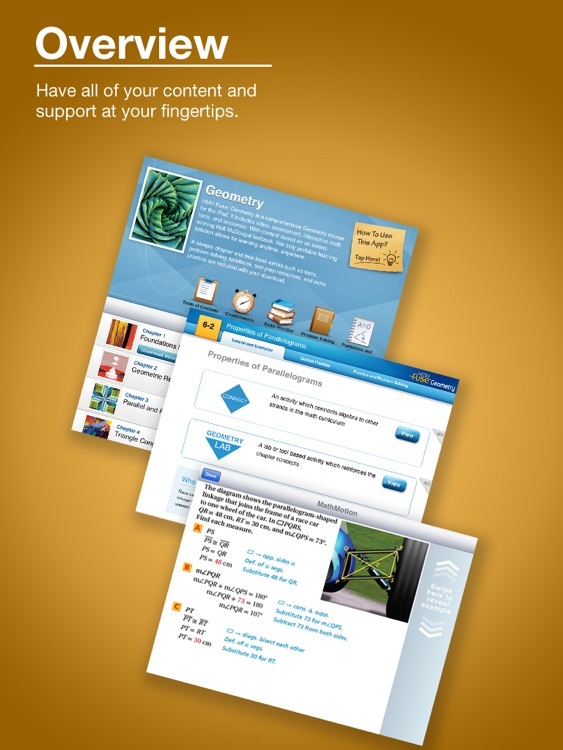 Try a Sample: Download and review one free chapter of content with all features and tools available for the user to review. 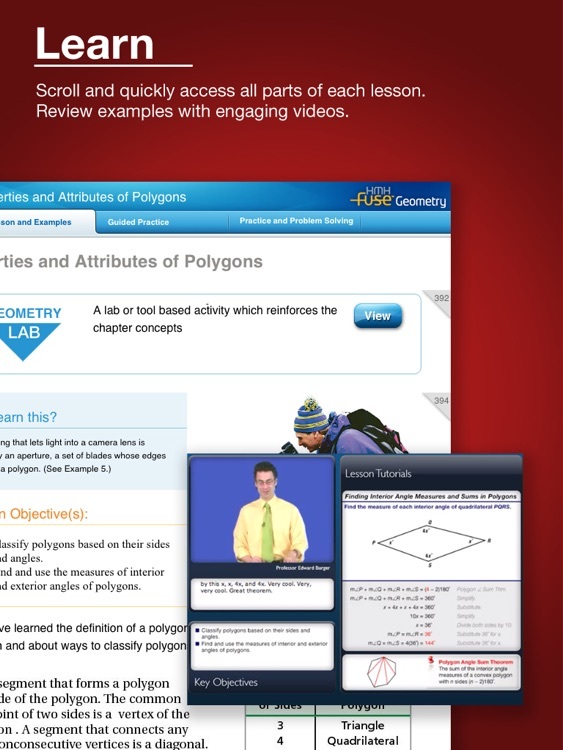 Individual Purchase: For just $19.99, purchase individual access to all of the FUSE Geometry Common Core Edition content using your iTunes account. This does not include the Teacher Resource Center. Institutional Purchase: Institutions may also purchase FUSE and provide teachers with the ability to obtain access to all of the FUSE Geometry content and allows teachers to access all assessment results in an on-line Teacher Resource Center and prescribe intervention or remediation as needed. For more information about institutional purchases please contact HMH Customer Service (888) 327-2906 or your HMH sales representative. 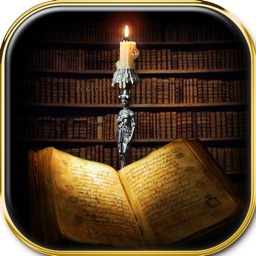 Please note: Due to many rich-media features in this app including 400 video tutorials, a graphing calculator and a student response system, the file size is much larger than a typical app and will take some time to download and install this complete curriculum.